Yield: Makes 8 one cup jars. Serve these easy-to-prepare spicy, pickled daylily buds and daisy flowers to impress your family and friends! Place daylily buds and daisies in a pan; add water just to cover. Bring to a rapid boil, cover, and simmer 15 minutes; then drain. 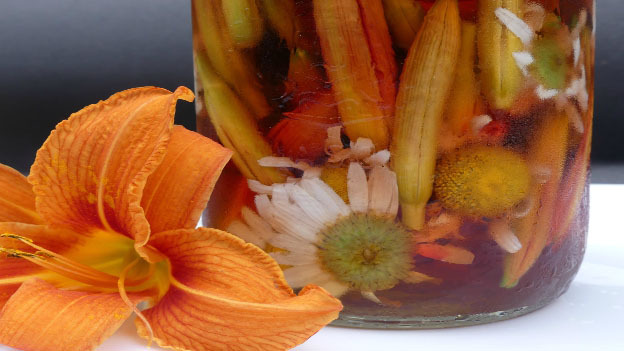 Place hot flower buds and daisies into 8 sterilized 500ml (1 cup) canning jars. Combine vinegar, brown sugar, sea salt, cinnamon sticks and cloves in a pan and bring to a boil; boil 1 minute. Simmer 5 minutes. Pour this solution over the buds and flowers, distributing the cloves and cinnamon equally. Seal immediately. Let these stand minimum one month before using to properly infuse the spicy flavour. Makes 8 one cup jars.